Newport Beach, CA, USA – Anaheim city school principals and teachers, friends of Mayor Tom Tait came to meet His Holiness the Dalai Lama this morning. In his introduction to His Holiness Mayor Tait mentioned the positive change that the City of Kindness project, and participating in the One Million Acts of Kindness campaign, has brought to Anaheim’s schools. He recalled that when Ven Tenzin Dhonden heard about what they were doing, he brought Mayor Tait to meet His Holiness in Dharamsala, for which he thanked him. “Firstly, I very much appreciate this opportunity to meet with people who are actively involved in education,” His Holiness began. “Our common goal is to build a happier humanity. The greater part of this century is still ahead of us. I believe that if we start working now on this with a clear vision now, the later part of the century could be happier and more peaceful. “These days if a human being is killed by a tiger or elephant it’s news, but to be killed by another human being is no longer extraordinary. Meanwhile, despite every human being having a right to be happy, we see images on the television of numbers of children dying of starvation. How can we remain indifferent? These people are our brothers and sisters. We have to do something. “Violence has long been part of human history, but in the past, involving hand to hand combat, its impact was limited. Today, we have weapons of mass destruction, such as nuclear weapons, that are so powerful, the whole of humanity is endangered. Violence derives from anger and anger clouds our ability to think straight and properly assess what is happening. Anger in turn is related to fear and anxiety. “One of the lessons we need to learn is how to cultivate those positive emotions that counter destructive emotions like anger and fear. Compassion, for example, brings self-confidence and the ability to act transparently. It strengthens trust which is the ground for friendship. “All the major religious traditions teach about love and to protect that message they also counsel tolerance and forgiveness. However, these days, when 1 billion people claim to have no religious faith, instead of relying on faith alone, we have to use our intelligence to examine whether anger brings any benefit. If we’re honest we’ll see that anger ruins our peace of mind. Fortunately, one of our qualities as human beings is our ability to reinforce such human values as warm-heartedness. His Holiness explained that we will only make the 21st century an era of peace on the basis of inner peace. However, he said, we won’t overcome anger and establish peace of mind just by praying for it. An outbreak of fire will not be quenched by prayer alone, it’s far more important to prevent its breaking out in the first place. In answering questions from the audience His Holiness made clear his view that ancient Indian psychology is relevant today, since it clearly explains how to increase positive emotions and reduce negative emotions. He pointed out that we all, even animals, have a basic seed of compassion, a wish for others to overcome suffering, but to raise and extend it to the point where we actually act on it takes training. He recommended adopting different approaches, experimenting and sharing what we learn with each other. He also remarked that anger and aggression sometimes seem to be protective because they bring energy to bear on a particular situation, but what needs to be acknowledged is that that energy is blind. He stressed that it takes a calm mind to be able to consider things from different angles and points of view. Noting that more and more people are paying attention to kindness, the evidence of the naming of a City of Kindness in Anaheim and a Compassionate City in Louisville, is that a revolution is taking place in education. He asked the teachers of Anaheim to help lead that revolution in the right direction. 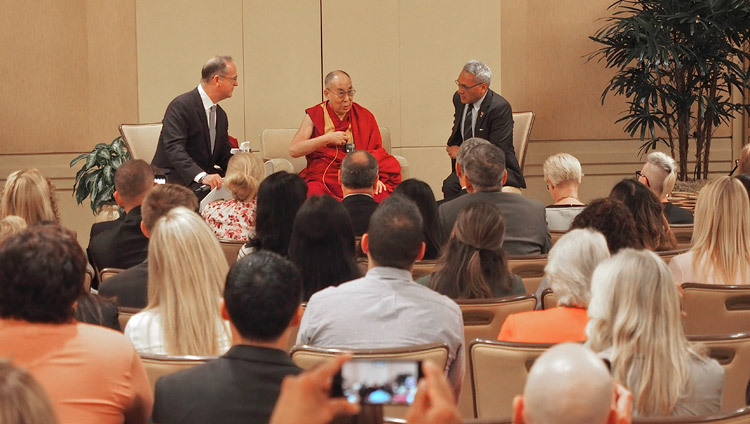 Meeting Orange County business leaders in the afternoon at the behest of Noah McMahon, His Holiness picked up his earlier theme that despite great material development people are increasingly showing interest in achieving peace of mind. He again stressed that, if we make efforts now, it is possible to envisage a happier more peaceful world emerging later in the century. He reiterated that scientists revealing findings that basic human nature is compassionate is a source of hope. He mentioned the power of being able to smile. Speaking of peace in the world prompted His Holiness to discuss the need for global demilitarization. He spoke with regret of the money spent on weapons, but also of the dangers of a policy of mutual destruction. Mentioning a dream of a world without borders, a truly global world, he wondered whether he would be thought unrealistic. He declared that the world belongs to the 7 billion people living in it, just as American belongs to the American people. He expressed regret at the US’s withdrawal from the Paris Accord. He speculated that if there were more women leaders the world might be a more peaceful and co-operative place. Challenged to say whether religion might have outlived its usefulness, he mentioned three aspects of religious tradition. The religious aspect involves the practice of love and compassion, the philosophical aspect, concerning, for example, belief in a creator or the law of causality supports this practice. But there is also the cultural aspect, influenced by social conventions. When this aspect is judged to be out of date, he said, it should adapt. His final remark was to note that while people go to great lengths to look physically attractive, inner beauty is far more important and a stronger basis for lasting relationships. 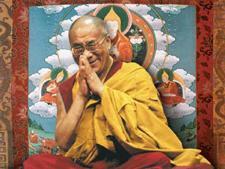 Tomorrow His Holiness will leave early to travel to Minneapolis.